Butler High School Donor Abby Hern poses with Dracula during a blood drive at Butler High School. 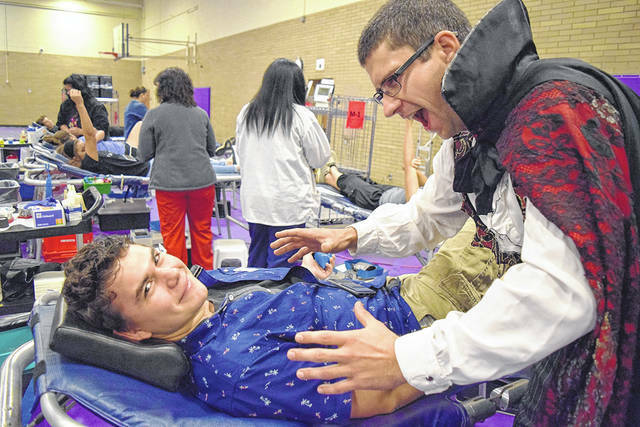 Butler High School Donor Konner Vandervort poses with Dracula during a blood drive at Butler High School. VANDALIA – It must be Halloween season in the Miami Valley if vampires are visiting Vandalia. 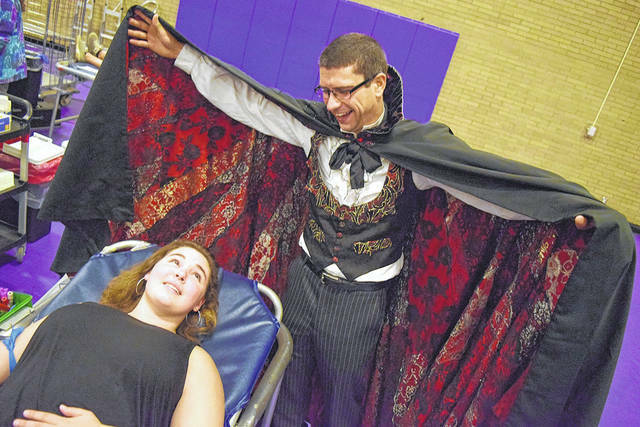 Dracula flew by Vandalia-Butler High School Sept. 28 to check out the menu at the Aviators’ blood drive. Vandalia’s Morgan Brazie, a volunteer with the Dayton Performing Arts Alliance, donned the count’s black tuxedo and blood-red cape to mingle with donors. He gave longing looks to plump blood bags and recently-wrapped arms as he posed for photos with student donors and volunteers, but minded his manners. The Dayton Performing Arts Alliance is partnering with Community Blood Center to promote blood donations and the Dayton Ballet, Dayton Opera and Dayton Philharmonic production of “Dracula: Bloodlines” coming up Oct. 25-28 at the Victoria Theater. Everyone who registered to donate at the blood drive received a voucher for a “buy one ticket, get one ticket” offer to see “Dracula: Bloodlines.” Vouchers will also be available through the Drama Club. Dracula also visited Elizabeth Koerner, also a member of the Drama Club, and a first-time blood donor. “It always seemed like something I should do,” said Elizabeth. 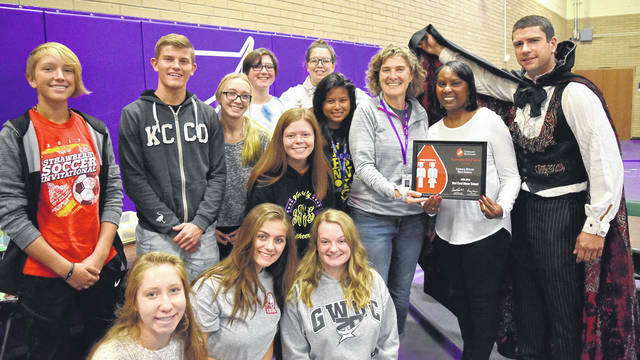 Dracula also posed with the Student Congress volunteers and advisor Kathy Baker as they received the Community Blood Center Red Cord Honor School award from CBC’s Cora Johnson. The volunteers stocked the Donor Café with extra refreshments and handed out t-shirts and Dracula: Bloodlines vouchers. Count Dracula was a cordial guest who resisted any urges to take a bite out of the collections for the day. The blood drive totaled 66 donors, including 32 first-time donors and 51 donations for 102 percent of the collection goal.